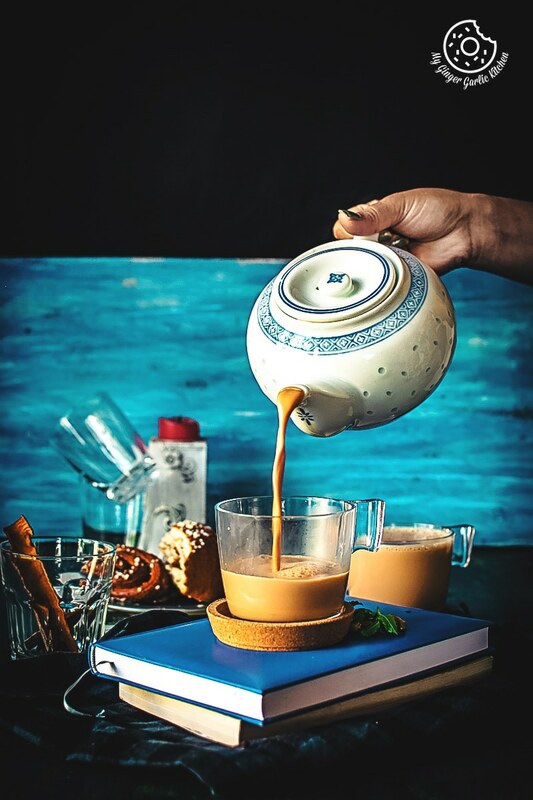 Learn How To Make Authentic Indian Masala Chai Recipe | Spiced Milk Tea Recipe with a simple video tutorial. Tea / Chai is India’s National Drink which is enjoyed by millions of people. 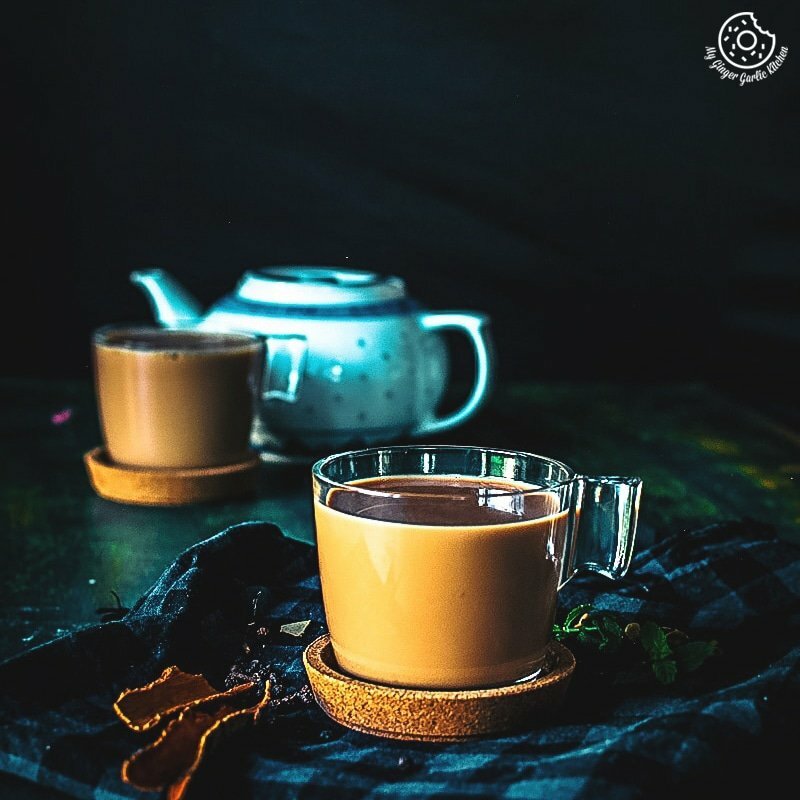 Indian chai is a deeply colored, rich, milky, piping hot, flavourful and sweet drink which is a perfect sipping for any day. In most of the homes, the morning starts with a cup of milk tea, aka chai. Bed tea is when people drink tea straight on the bed as soon as they wake up. A large number of Indians drink it around throughout the year, supplementing their breakfast with this tea. Chai is made across the country and is enjoyed both at home, and at tiny tea-stalls at roadsides mostly everywhere. A basic chai is usually served throughout the year. But masala chai is specially served during winter or monsoon time. Everywhere you go to meet someone, tea is always offered. Chai is a common name for milk tea in India. Let’s understand more about chai in detail below. The word ‘chai’ literally means tea. Chai is an Indian name for milk tea which is now popular around the world. 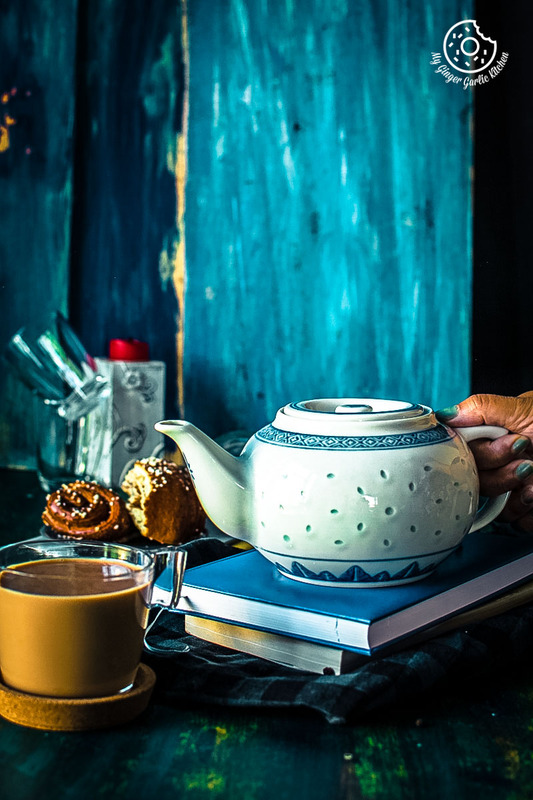 Growing up in India, Chai has always been an integral part of my daily life. Tea is one thing which is everywhere, be it at get-togethers with friends and family or at small celebrations. A cup of chai is always there. Chai is must thing to offer to guests when they visit you. Everywhere you go, tea or coffee is always offered. Though, mostly tea is the default choice. Spiced Milk Tea is a cure for all problems. 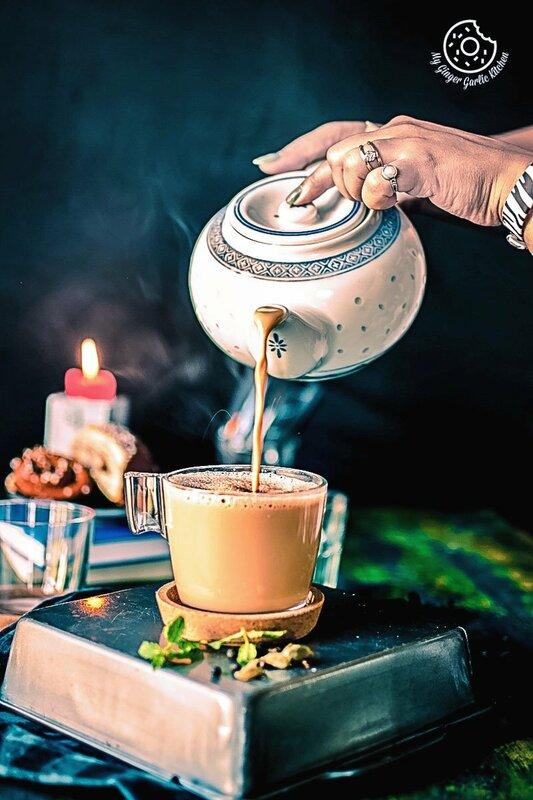 A conversation is never complete until you have a cup of chai. Friends visiting each others house and discussing their problems over a cup of tea, is a very common thing. A “Good Chai” can really take away all your problems for some time. 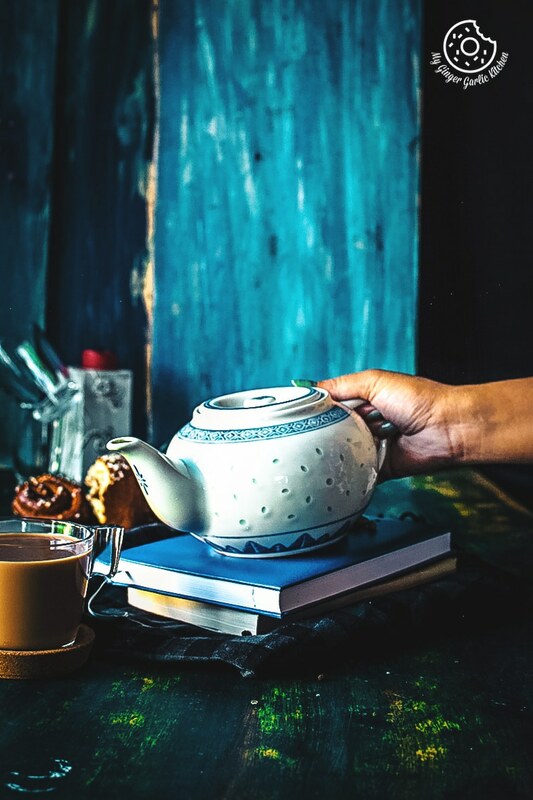 Some actually believe that a cup of tea works as a de-stresser for them. For me, a good tea is so soothing and comforting — an ultimate cuppa joy. Is adding milk necessary for Indian Masala Chai? Yes, it is. In India, people are not so fond of plain black tea. Indian tea should always be mixed with the milk. Milk tea is a drink made in every household and sold on the tea stalls all over India, or you can get it from any chai-walla. There are particular tea stalls, and the tea seller is known as chai wallah. Tea stalls are the places where tea vendors pour the tea straight from the tea kettle into small cups. A tea stall is a favorite place during breaks for people during office hours. Even though tea is served on the desk a few times a day, but some people prefer to go to tea stalls to have tea. You know, to get the real feel. If you visit India, you will see chai-wallas at every corner of the streets. You will see them at the train stations and almost at every public place catching the attention of passing-by people with a rhythmic sound of ‘Chai, chai, chai Garam which means ‘tea, tea, tea, hot tea’. In India, sutta is a term for cigarette smoking and Chai Sutta is a popular term amongst cigarette smokers. Witnessing people sitting on wooden or cane stools and enjoying a cup of hot milk tea is a common sight. How many different varieties of milk chai is made in India? Kadak chai, where tea has a dark shade and less milk. Then there is mint chai, where mint is added to chai. Adrak elaichi wali chai, where ginger and cardamom is added to the milk tea. Kesar chai: this is a milk tea where saffron is added for fragrance. Cutting special, where tea has more milk and flavored with cardamom. Ginger Tea, where ginger is added to the tea. This tea is specially made during winter time. It is believed that the strong ginger flavor in this tea helps to fight the cold. Tulsi Chai: In this tea, holy basil leaves are added to the milk tea. Cutting Chai: This tea has more water and less milk. Rose Tea, is where dried rose petals are added to the milk tea for the making the rose flavored chai. Fennel Tea: Here, fennel seeds aka saunf is added along with ginger, and cloves, to this milk tea. 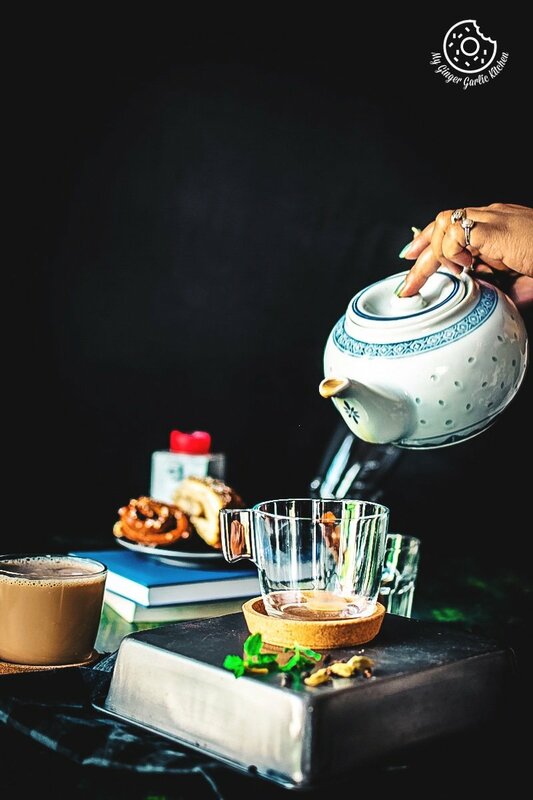 Then there is masala chai: Masala refers to the combination of spices, which often includes cardamom (elaichi), cinnamon (dalchini), dried ginger roots (saunth), cloves (laung), peppercorns (kali mirch), and fennel (saunf). This masala chai is so warming and delicious. Many people prefer to make fresh chai masala prior to making masala chai, and stock it up for later use. Is there only one way of making chai masala? No, there are many ways of making chai masala. Masala meaning a mixture of spices used to make milk tea. 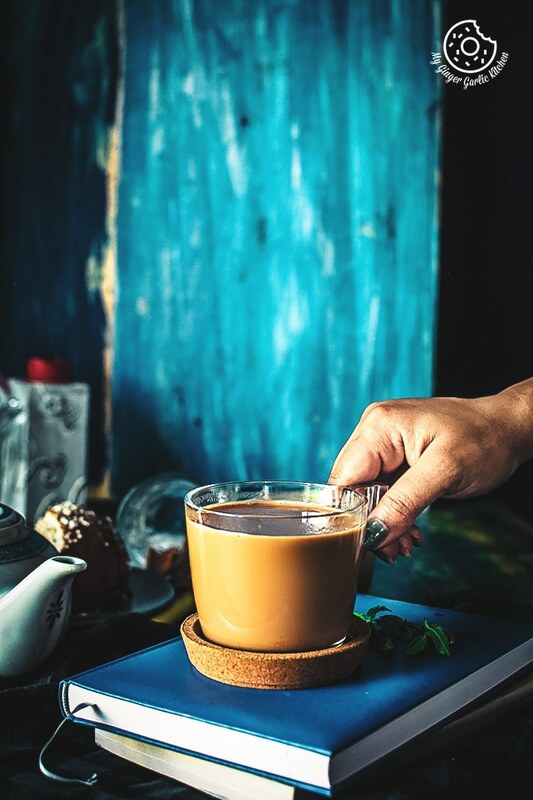 For masala chai blend, people use different flavors suiting their taste buds. Many like to add flavorings such as nutmeg (aka jaifal), and fennel seeds (aka saunf), while others only want to stick with peppercorns, cardamoms, and cloves. Is there any readymade chai masala powder available? Yes, many tea blends sell readymade chai masala powder. This is a great solution for lazy people who want a quick and satisfying tea. Is it easy to make chai masala at home? Yes, it is easy. If you are like me who loves really sweet and aromatic homemade masala, then you can easily make it at home. Some people like to make fresh masala every day, while others prefer to make there own chai masala powder for daily use. My mom also makes dry chai masala powder and adds it to the milk tea along with freshly crushed, or grated ginger and mint leaves. If you also want to make your own chai masala aka spice powder for tea, then you can easily make it at home. 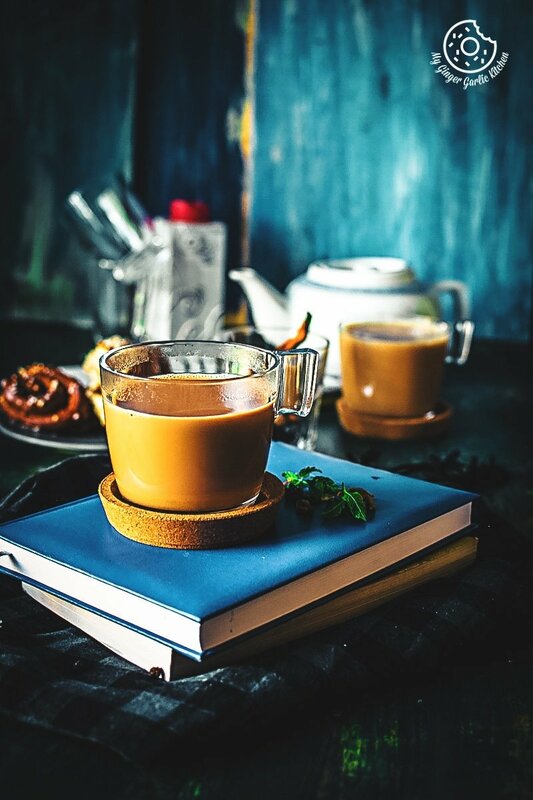 What are the benefits of drinking masala chai? It is believed that the masala aka spices in this tea keeps the body temperature warm, which then helps in breaking up the blocked sinus due to cold. It also clears a sore throat. What are the best Tea Leaves for making tea? The good tea leaves are indeed very crucial for making a good chai. Many people assume that the best quality tea leaves makes the best tea. For making masala chai, always use small grain tea, not whole leaves. There are many tea brands easily available at Asian/Indian grocery stores throughout the world. How long can we store chai masala powder? You can store chai masala powder for up to 2 months in an airtight container on a room temperature. Homemade chai masala powder is one such recipe which is passed down the generations in every household. Everyone has their favorite masala recipe for making incredible chai. My homemade chai masala is a delicious blend of mint leaves, ginger, cloves, cinnamon, cardamom, and black pepper. The combination of these spices adds a delicious warmth to the Indian milk chai. What type of milk is recommended for making Indian milk chai? Any type of cream milk is good. But never use non-fat milk or skim milk for making milk chai, because you won’t get the flavours from spices and the tea would taste bitter. So the point is that there should be some kind of fat in the milk. Even 1% fat would work. I usually use 1.5% fat milk for making my tea. What is the right method of making chai? There is not one way of making chai or milk tea. There are many ways to make it. I have seen people just dump all the ingredients at once and let it boil until tea turns into the desired color. Others like to follow the protocol of adding one ingredient at a time. What is my preferred way of making Masala Chai? Masala is a ground blend of sweet spices. So for masala chai, I like to first boil my spices in the water for sometime before adding anything else. In my recipe water should be first brewed with ginger and mint and then with spices in a saucepan on the stove. Then I add tea leaves and let it boil. Then I add milk to give it a good stir and let it boil until I get a rich and beautiful dark brown color. Lastly, I add sugar and let it boil for sometime. Finally, it’s taken off the stove and strained into tea cups. Done! Should you use Tea bags or not? Or are there any preferred tea leaves found to be best for making masala chai? Usually, loose black tea leaves are used for making Indian milk tea, but you can surely make your chai using black tea bags. This is what I do when I run short of tea leaves. How to make fresh masala for masala chai? Here’s the method. In a mortar, crush the ginger and set it aside. Add some fresh mint leaves and set aside. Now add cloves, cinnamon sticks, cardamom pods and cloves, and crush them. You can also use a grinder for this. Your freshly made masala is done. How much sweetener is advisable for this tea? It’s up to you. Many people like it really sweet and others like it mildly sweet. And there are some who don’t add any sugar at all. All in all, there are no hard and fast rules about how one must drink their chai. Simply follow your taste preferences. If you want to know about my taste inclinations, then I would say that the tea should be generously sweetened. This is to make sure that you are having your tea in the most authentic way possible. Can you replace sugar with something else for making your Indian Masala Chai Recipe? You can completely omit any kind of sweetener, or you can replace it with jaggery or palm sugar. Or you can add some honey to your tea. If you are opting for honey then always add it to the teacups when the tea has slightly cooled off. What is the right ratio of milk and water in a perfect Indian Masala Chai Recipe | Spiced Milk Tea Recipe? Like I already said, there is no right or wrong way of making a milk tea. People generally use one part milk to two parts water. But I like to use a 1:1 ratio. This makes it a bit richer. 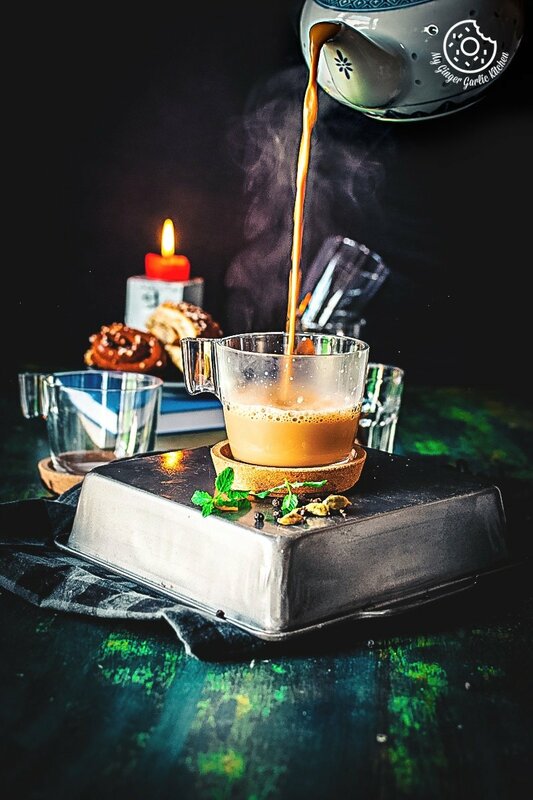 Masala chai: Masala refers to the combination of spices, which often includes cardamom (elaichi), cinnamon (dalchini), dried ginger roots (saunth), cloves (laung), peppercorns (kali mirch), and fennel (saunf). This masala chai is so warming and delicious. 1. In a mortar, crush the ginger and transfer it to a plate. Set it aside. 2. Add mint leaves and crushed them slightly, and transfer it to a plate. Set it aside. 4. Chai masala is ready, keep it aside. 1. Heat 2.5 cups water in a saucepan. 2. Add crushed ginger, crushed mint and let it boil for 1 minute. 3. Add the crushed chai masala and stir well. 4. Let it boil for 2-3 minutes. Keep stirring occasionally to infuse the masala flavors. 5. Now add tea leaves and let it boil over medium heat for 4-5 minutes. 6. Add in the 2.5 cups milk and let it boil for 5 minutes over medium-low heat or until the tea has a nice rich color. 7. Add sugar and stir well. Let it boil for 2-3 minutes over high heat. 8. Strain the tea into cups/mugs. 9. Serve hot with your favorite snacks. 1. You can replace loose tea leaves with 4 black tea bags. 2. You can swap sugar with jaggery or palm sugar.